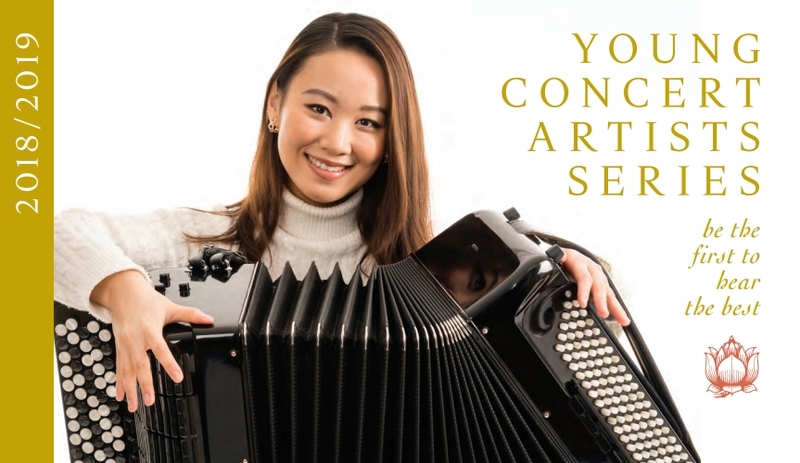 Hanzhi Wang isn't the first accordionist to specialize in new classical music, but she is the first-ever squeezebox player to earn inclusion on the Young Concert Artists roster. Even though more composers these days are writing for the accordion, that's still a pretty big deal. Wang has a magically dynamic album of concise new works by Nordic composers, On the Path to H.C. Andersen, streaming at Spotify. She’s making her Carnegie Hall debut on Oct 22 at 8:30 PM in Zankel Hall, where she'll be joined by the Zorá String Quartet, playing works by Bach, Gubaidulina, Moszkowski, Piazzolla and Martin Lohse. You can get in for as little as $10. Along with this past summer's Bryant Park Accordion Festival – and maybe Golden Fest, which always has plenty of accordion music – this is THE big accordion event of the year in New York. The first composition is Lohse's Menuetto, a steady, Philip Glass-ine, austerely waltzing theme punctuated by airy, rather still interludes, growing more uneasy as its distantly baroque-tinged, cell-like variations rise and then recede. Lohse's triptych Passing begins with a similarly circling if almost marionettishly pulsing allegro section. The steady, moonlit waltz that follows is deliciously ominous; the concluding variation is 180 degrees the opposite until that same resonance is artfully interpolated amidst the starry, flitting optimism. Wang's precision, all the way through a persistent strobe effect, is striking. Wang concludes the album with Svend Aaquist's practically fifteen-minute Saga Night, which quickly becomes a dissociatively eerie, rhythmically challenging fugue. A heroic theme is alluded to but never hit head-on; then a variation on the opening quasi-fugue makes an enigmatic return. In a way, it's practically a synopsis of the album as a whole. While some of these pieces could conceivably be played on organ or by a string ensemble, nothing beats the plaintive lusciousness of Wang's instrument of choice.